The Stockholm Library is a magnificent building designed by Gunnar Asplund in 1928. 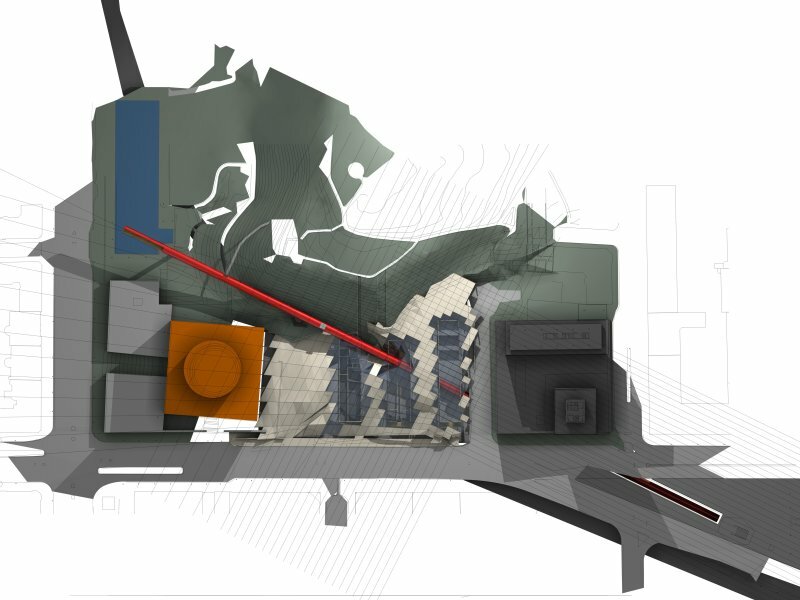 The competition aimed at extending the building, which is now too small to contain the collections of the library, and adding new multimedia sections. 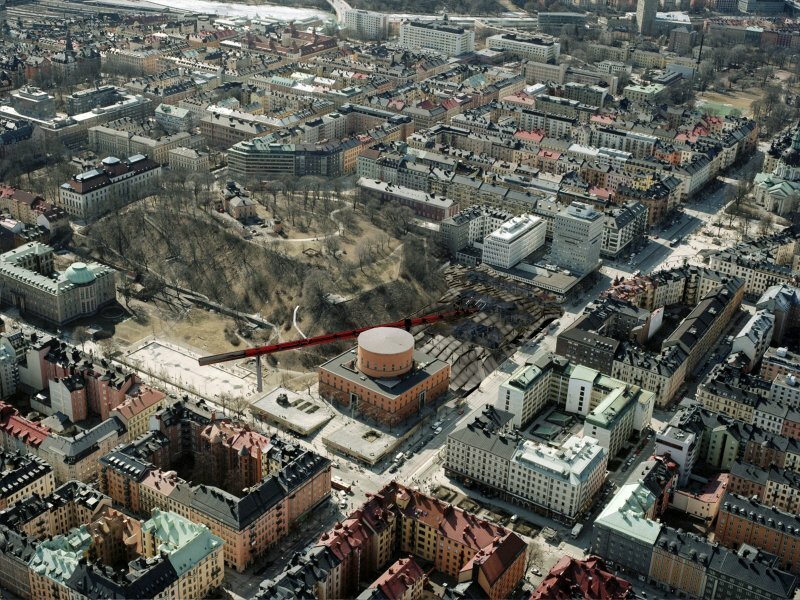 The site includes the Asplund building itself, and 3 posterior buildins on the side, also classified as heritage buildings, but of much less interest. This project, more than a library extension, is a library entrance. It is a library that invites you to curiosity, have a look before you try, come down, enjoy, explore, feel part of the spaces an the histories, and make your own path. There, at the end, the temple and its secrets are waiting for you. This project also marks a moment between past and future. Some things are recycled, others make room for an unknown future. It allows you to look outside and feel that moment. The new library is one single open space. Its internal separations deviate the path, not the view. It has many different spaces to explore, big open courtyards, low galleries, bridges. But you never forget that you are underground, in the basements of a city, where many secrets are hidden. The space, although fragmented, is one continuity. The separations between activities are minimal and inner organisation develops accordingly, minimising transitions. Visitors and staff are using the same space, making comunication friendlier and easier. 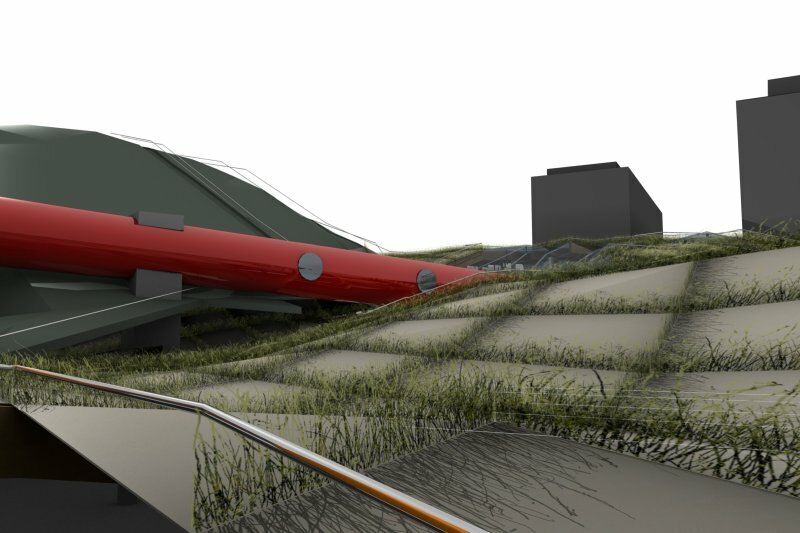 The project has a complete and optimal bioclimatic behaviour. The glass roofs receive sun almost all the day, low floor heights give a compact air volume, fresh air enters the project from lower points and travels freely against the roofs ensuring good control over temperature. Plants in the central areas also help to normalize humidity. As the new library is located between the Asplund park, the hill, Odenplan and Odengatan, it also gathers these spaces and make them part of a common whole. 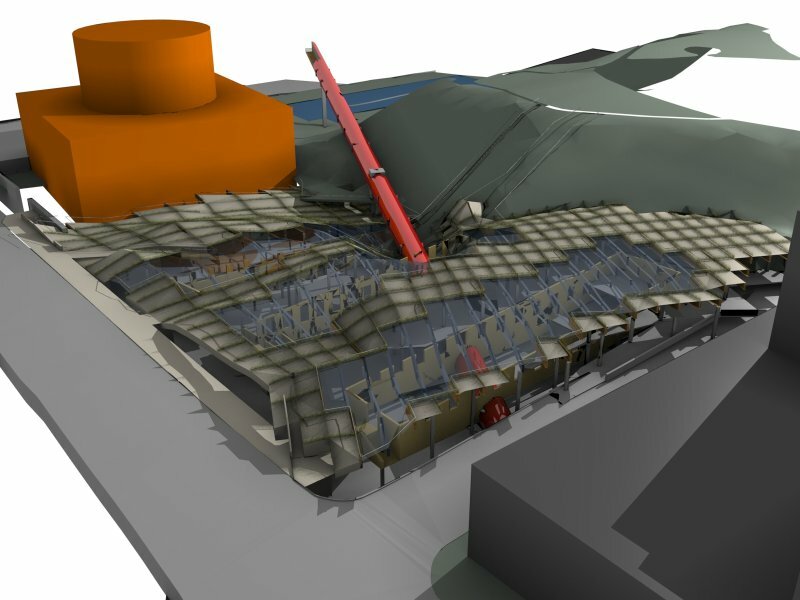 The roof of the new library forms an entire public space that can be used in many ways, since the main structure is dimensioned to be able to receive temporary constructions. But its best use is simply to let people walk around, enjoy the sun when it comes and let everyone invent its own scenario. Some areas are walkable, some not, but even where you can't walk there are things to see. Between the concrete slabs, high grass and native plants from the Stockholm bay are growing, occupying the space. They form "rooms" on the slabs, catch the wind and the noises, and make the roof change over the seasons. The roof also forms a new base to the hill, freeing it from being hidden behind the buildings and giving it back to the city. The roof is an invitation and an encouragement to climb the hill. Several paths and stairs are created, and if you prefer, the tube gently drives you half-way to the top. The annexes gain a new life in the library. Their entrances are preserved, and they are still used as a library. But where they occupied the view and the open space, they now work underground, their walls store heat from above, and they are the open places in the library, where you can come read a book or enjoy the natural light and heat. The spaces are organized by a simple and regular structural grid. One of the annexes will be reinforced underneath, and the concrete floors help stabilize the whole construction and link the existing parts with the new ones. 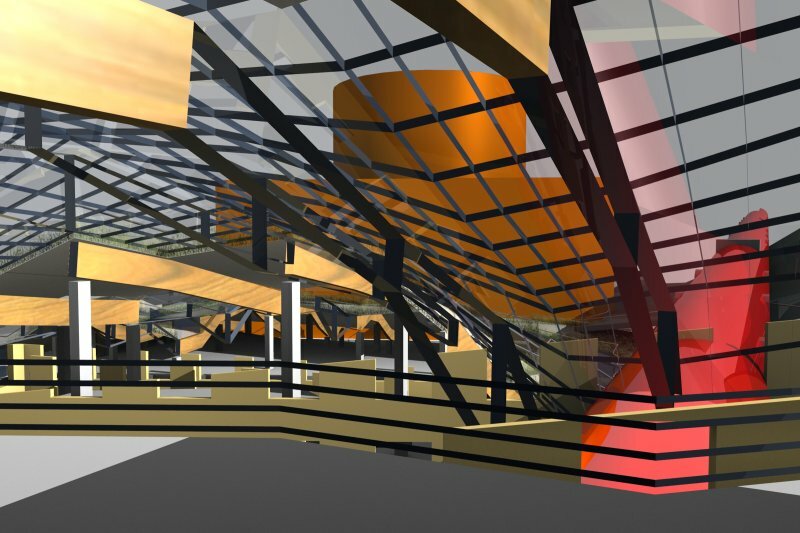 The roof structure is hybrid, mixing wood and steel, concrete and glass. The tube itself, finally, is meant to be an engineering challenge on its own, independant from the rest. The new library is a big hub, welcoming people from all directions. 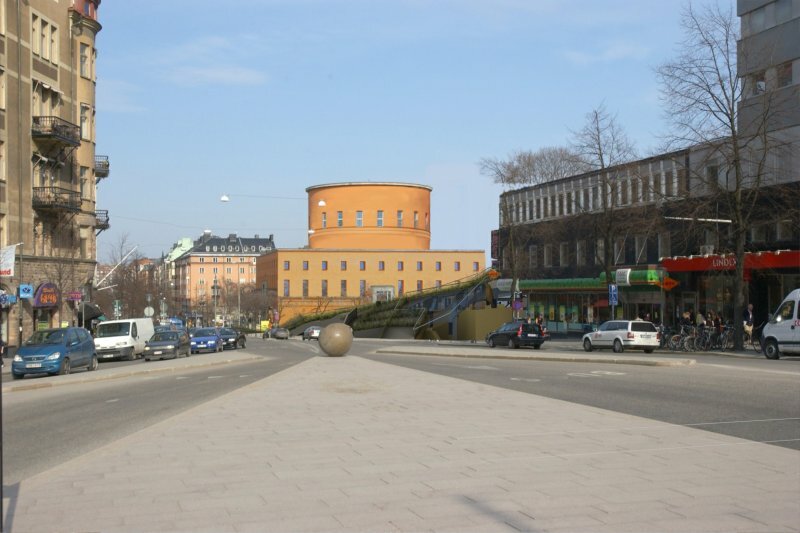 You can enter by the Asplund building, the Asplund park, the hill, the subway, Odengatan, Gyldngatan, the Diligentia building or even by the roof. Inside the library, open and naturally lit areas alternate with darker and lower sections. Space dilatations and compressions show naturally the way to go in an out, and the path to the Asplund building, by the basement, is like a initiation ritual before entering the temple. 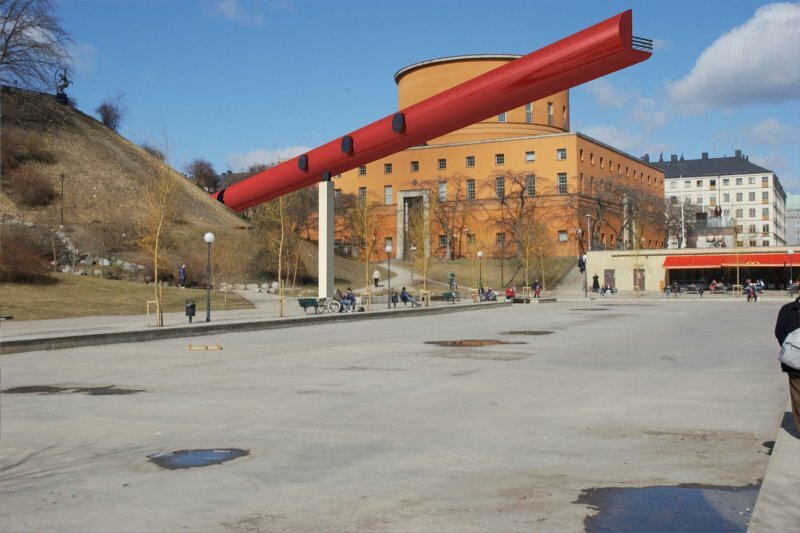 The tube is the link between all the parts of the project, between the project and the city, and as the visible part of the new library, it is our humble contemporary contribution to the universe ruled by the Asplund library. The tube cleans the space, making the existing building occupy the place it deserves. With a smooth 4.5% inclination, the tube is a multifunctional space, housing circulation, temporary exhibitions space, bar, visitors activities, sightseeing terrace and, as it is located exactly along the East-West axis, as an educational tool and an extension of the observatory. By this the tube contributes to keep the humanistic, academic nature of the whole observatory hill area. The tube also has bioclimatic function, as it can be used to bring in fresh air from below and to help extract hot air from the roof.